What follows is a fairly detailed discussion about the exterior wall assembly that we chose for this house. Warning, charts and graphs and a wall of text ahead. We believe this wall assembly meets these criteria well. Most people understand the basic relationship of more insulation equaling improved energy performance. But how much is the right amount? Calculating the insulation level sweet spot is difficult, if not impossible to do precisely, since it involves variables that change over time (like energy costs and interest rates) and also value judgements (like how much time is an acceptable return on investment, and at what point could this money be more effective elsewhere? Heat load calculations for buildings give the appearance of weighty scientific certainty, but are far from accurate, and don't factor many things in. Here is a good discussion on the subject for further reading. Also, you have to balance the insulation levels against other factors, such as that of the windows and doors, and the exfiltration rate of the home. It would not make sense to have super-insulated walls and leaky windows. 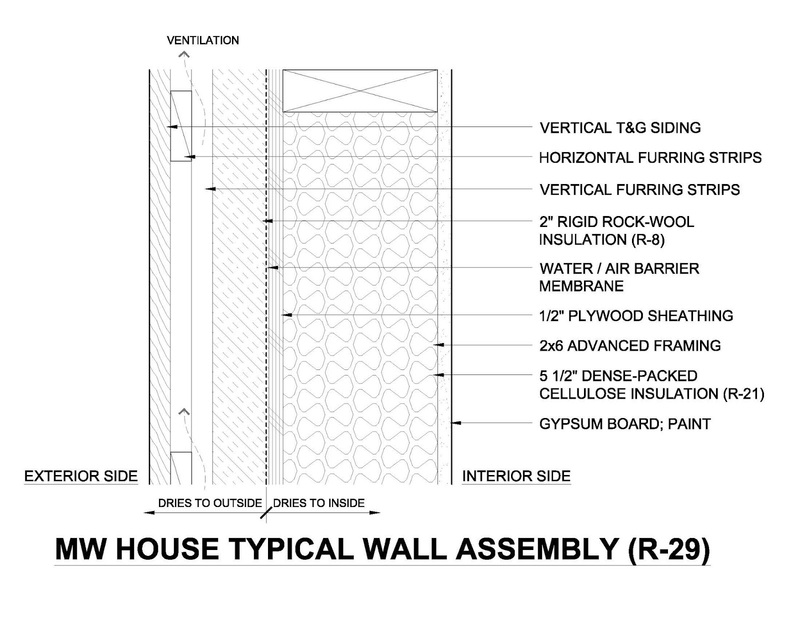 Our typical wall assembly has a thermal resistance value of R-29, which is a pretty well-insulated wall. For advanced-framed buildings like ours, the current code requirement is R-19. This wall exceeds code by half again. This assembly also utilizes a 2" layer of continuous insulation, which is far more true to actual R-value than cavity insulation interrupted by thermal bridges (wall framing, headers, sills, beams, etc.). Sure, some go much farther with R-value, but there are other considerations, as you'll see below. Any modern wall really should perform very well from an air-sealing standpoint. It is one of the most important factors for good energy performance - as important as being well-insulated, and 30% or more of your energy bill.. The primary air seal on this home is the Water / Air Barrier Membrane. This runs continuously around the house, and over the roof (to be discussed in future post), with meticulously sealed seams. Adding to the continuous membrane, the dense-packed cellulose in the wall cavities adds air sealing performance, as discussed here. Our performance goal for air sealing is a conservative 1 ACH50 (Air Changes per Hour at 50 pascals air pressure). We are hoping to achieve the passive house standard of at least 0.6 ACH50, but expect that our doors and windows won't be quite tight enough. Regardless, this will be a 'tight house'. This is an important one that many people, even in the performance-home community, don't adequately consider. You have all certainly experienced water droplets forming on the side of your glass or drink can. This happens when the difference in temperature between the surface of the container and the surrounding air causes the moisture in the air to condense. This doesn't just happen on drink cans, this happens in your walls. Or anywhere else that moist air experiences enough temperature difference. Most of the year your home will have a temperature difference between the inside of the house and the outside. This means that moisture is occurring somewhere within the wall, and if it is inside the house (and it usually is!) it provides moisture that can lead to problems like mold and rot. The idea of a well-designed wall is to keep this point from regularly occurring inside your house. We can study our walls in relation to the insulation levels, dewpoint, and local climactic data, to get a picture of what is likely to happen within them. Here is how the temperature gradient looks in a "standard" 2x6 wall (below). The exterior on the left, and the interior on the right, and the diagonal line showing the temperature changing through the wall. For Portland, the average lowest temperature is 36 degrees. An comfortable interior temperature of 70 degree is assumed. A relative humidity (moisture content) of the interior air is assumed at a comfortable 40%. We can then find the dewpoint is using a psychometric chart. Portland has primarily a heating climate, so moisture drive is occurring from interior to exterior. For a portion of the year this can change - hence importance of wall drying ability in both directions. Note that the dewpoint is happening inside the wall, on the interior side of the water barrier. Here is how the temperature gradient looks in our wall (below). By adding exterior insulation, we can move that dewpoint outward. You can see the line of the sheathing temperature dipping down toward the dewpoint, but not quite getting there. To prepare for that possibility our wall assembly is designed to promote drying in either direction. This is important, because we must assume that all walls will become moist at some point, due to a variety of reasons (unusual outside temps, unusually high interior humidity levels from steam showers or boiling lots of water without venting, etc)- we really should make sure that they can dry, regardless of where the moisture occurs. On the outside of our wall, the rockwool insulation is hydrophobic (resists water absorption), and if wet it retains most r-value and dries quickly, and is also fire-retardant. It is 'vapor-open', meaning that moisture in vapor form is not trapped and held in place by it., and allows for drying to the outside. The use of a rainscreen cavity does more than promote drainage; the air flow promotes drying and provides a pressure break to prevent solar-driven vapor-drive into the wall (another major source of wall moisture). Drying to the inside, the hygric buffering capacity of cellulose promotes moisture diffusion and drying to the inside, uninterrupted by any impermeable vapor barriers. Finally, a Heat Recovery Ventilator keeps fresh air circulating, which also promotes drying, among other benefits. - Portland is a predominantly heating climate. This makes the equation as shown above. Some climates are reversed - the cold side is the interior due to air conditioning. Thus the dewpoint location is similarly reversed. Some climates have equally cold winters and scorching summers...in this case the dewpoint will move around, causing major problems for wall assembly design. A wall that can dry in both directions is especially important here. - Many people ask: "why is this a problem, when no one cared about it in the past?" The answer is this: old wall construction was notoriously air permeable. The walls got plenty wet, but dried readily, since air was constantly passing through. Ever live in a drafty old home? Maybe you didn't have mold, but you sure weren't too comfortable or energy efficient. Now that we care about comfort and energy, we build better insulated, more air tight buildings. The rash of mold issues we have all likely heard about were a part of the learning curve. Builders sought to meet market demand for comfort and energy, and other unforeseen problems developed. Those that have learned, have changed their approaches. There has been a lot of science, testing, and study since the problem days. Those that say "we've done it this way forever, it will be fine" are not paying attention. Our walls are essentially 2x6 construction - familiar to builders and most common in our area. Exterior insulation of any sort can be a learning curve to some old-school builders, but for most now it is a common occurrence that they have dealt with before. The same goes for rainscreen construction. This is a relative judgement, of course. This wall does cost more than a code-minimum wall, but hopefully you can see why it is worth it, and why a 'standard' assembly wouldn't be a good option. Building a 'green' home is hardly sustainable if the walls don't last, inhabitants are not comfortable, or mold drives you out of the building. We believe in investing a little more for a quality, long-life shell. There are few other wall assemblies that perform as well as this one does in all categories for the money, for this climate. I encourage you to share your thoughts on this, or other good wall assemblies - this is by no means the only 'best' wall assembly for Portland. Lets keep the dialogue open and active to the benefit of us all.